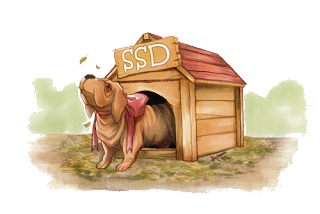 Just a little post to say that Sad Sausage Dogs is now “unofficially” up and running, though there are still a few bumps to flatten out. However, we’ve got a Twitter page and Facebook fan page up now as well and eventually the comic pages and additional updates will automatically feed into that. (And once we get going with that, I’ll probably feed it onto my own Facebook pages too – we’ll have to see. As an aside, Aimo also drew us little avatars. And I have to post mine here, because honestly? Phineas and Tumbleweed are playing cards in it. This entry was posted in blog and tagged sad sausage dogs, updates. Bookmark the permalink.